Forget making scrapbooks of your kids, make them with your kids! Here are some tips on getting started, from DealDash. Making scrapbooks is an enormously popular pastime that you should definitely do with your kids. There are so many different things that you can do with a scrapbook. So just why should you try making a scrapbook with your kids? Lots of reasons! Here are a few from DealDash for you to think about. Making a scrapbook with your kids will allow them to be creative. There really is no right or wrong when it comes to scrapbooks so you can let your kid’s creativity go wild. It will really let them be able to create something that they will be happy to share. Hopefully, they will continue to enjoy in the future. 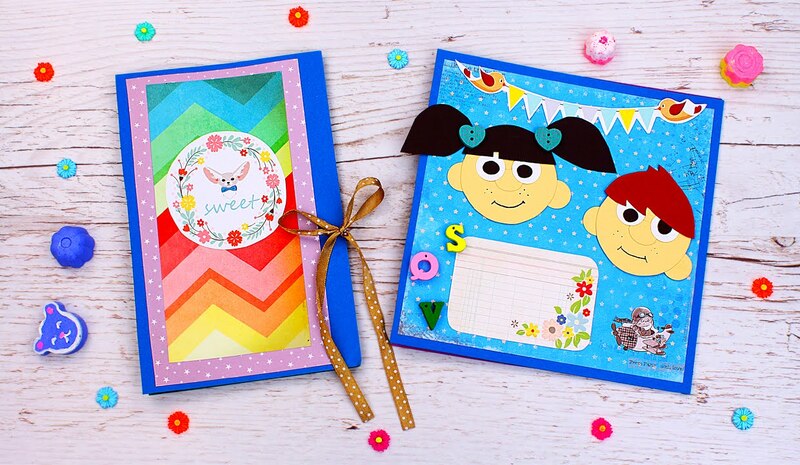 So make sure to plan for your kids to show their creativity while creating a scrapbook. Kids love arts and crafts, they’ll love it! Making a scrapbook is a great way for your child to learn more about their family. You can tell them stories from when they were younger or about you and your spouse before they were born. Photos are a great way to remember the past and keep great memories close to their hearts. The great thing about scrapbooks is that they don’t necessarily need to be about family. They can be about a fun trip or even about a family pet. So plan for at least an hour or two of working with your kids on the scrapbook that you plan on making. This is also a great way to tell your kids about people in the family that they never got to meet or they don’t see very often. What’s Important to Your Kids? Making scrapbooks allows your kids to think about things that are important to them. From family to friends there are a whole lot of people, places, and things that your kids can put into a scrapbook. It really gives them the opportunity to save valuable things in a fun and creative way. Maybe they would like to make a scrapbook of a special trip, or even of a whole school year. So if you are looking for a fun and creative activity to do with your kids then you should look into all that creating a scrapbook can offer you. You will have such a great time creating memories with your kids. They will love it, and ask you when you can make another one together. Give it a try! Thanks so much for reading this DealDash article on scrapbooking with your kids. Don’t forget to check back every day for new articles here. Also read our sister blog, DealDash Tips. We love to hear from our readers. If you have any comments please leave them down below. Scrapbooking with kids is fun, creative, and keeps them happy. You can get gift cards to big box stores that have craft supplies from DealDash. Always get your gift cards on DealDash for the best deal. DealDash has gift cards for all occasions. Visit DealDash now to see how much you can save. Have a great time on DealDash and happy bidding everyone! This entry was posted in Kids and Parenting, Lifestyle and tagged arts and crafts, baby, child, children, crafts, Deal Dash, DealDash, DealDash Auction, dealdash auctions, dealdash.com, family, fun, kid, kids, scrapbook, scrapbooking on April 20, 2018 by . Scrapbooking is fun for the whole family. Here are some ideas from Dealdash to help you with scrapbooking. Scrapbooking is a fantastic pastime for those looking for a fun way to preserve memories. One problem that you might have with creating a scrapbook is that you can have a difficult time coming up with ideas for your projects. Here are some ways that you can get ideas for new scrapbooking projects, from DealDash. You can look on the internet for new ideas for scrapbooking projects. You are going to find that the internet will be a huge resource for those looking for ideas for their next scrapbook. There are so many websites out there dedicated to scrapbooking and crafts so you are bound to find an idea or several that you would enjoy doing. There are also many blogs that you can check out about scrapbooking (after you finish reading the DealDash blogs, of course)! Turning to magazines dedicated to crafts is another thing that you can do in order to ideas for your next scrapbook. There are quite a few magazines out there that are dedicated to crafts like scrapbooks so it would definitely be worth your time to purchase or borrow a few. You will be able to see what kind of ideas others have come up with and make them into your own. Consulting people that are into the craft of scrapbooking is another thing that you can do in order to get new ideas for your next project. This can be done either on or offline depending on what works best for you. You can discuss the project that you have in mind and see what kind of ideas you can come up with. If you don’t have any crafty friends then craft store employees can be a good source of information as well. As you can see there are many ways that you can come up new ideas for scrapbooking projects. You might just find that you want to try more than one suggestion to get ideas for your project. It will certainly be worth your time and research if you take the time to look into these tips. Before you know it you will have a beautiful scrapbook to share with friends and family. Thanks so much for reading this DealDash article on scrapbooking. I hope that you found it helpful. Don’t forget to check back every day for new articles here are well as on our sister blog, DealDash Tips. If you have any requests for specific articles, please feel free to leave a comment below. Please let us know what you would love to read about. Do you need craft items? Go check DealDash for printers, cameras, and more. DealDash has all of the items that you need. Visit DealDash now to see how much you can save. Have a great time on DealDash and happy bidding everyone! This entry was posted in Uncategorized and tagged crafting, crafts, DealDash, DealDash Auction, dealdash auctions, dealdash.com, family, paper crafts, scrapbook, scrapbooking on September 13, 2017 by .